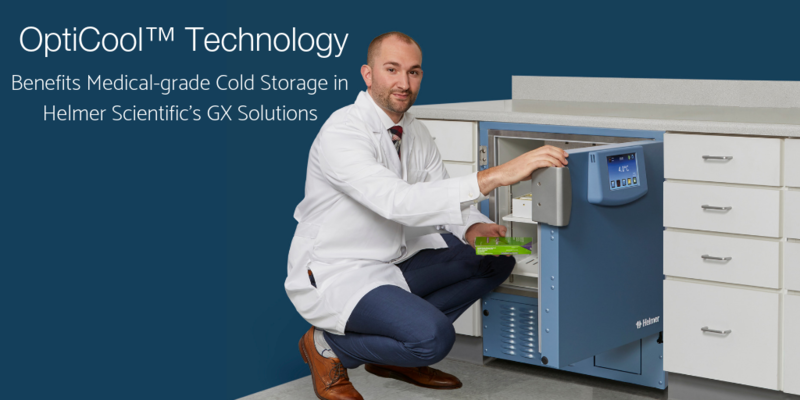 OptiCool™ technology in Helmer Scientific’s GX Cold Storage Solutions ensures temperature-sensitive blood therapies, clinical samples, reagents/controls, medications and vaccines are appropriately safeguarded. OptiCool™ is necessary to maintain patient safety, support regulatory compliance, and prevent economic loss. The new OptiCool™ technology utilizes variable capacity compressors and natural hydrocarbon refrigerants to benefit clinical applications. Variable Capacity Compressors (VCC) used in combination with Electronically Commutated Motors (ECM) are designed to run using a broad range of speeds that vary according to conditions, ensuring the evaporator runs at an optimized level to maintain desired cabinet temperature. By running at variable speeds, these ECMs drive much improved system efficiency, and heat generated by the evaporator fan is significantly decreased, lowering the demand on the unit’s compressor system. Run speeds respond appropriately and efficiently to maintain target temperature. VCC and ECM replace less efficient motors historically used in medical-grade refrigeration. For medical-grade cold storage applications, VCC and evaporator fans ensure temperature-sensitive products and samples remain stored under the appropriate conditions. For example, when doors of a medical-grade refrigerator are opened, or product with heat-load is introduced into the cabinet, it is critical that the cold storage unit recovers temperature quickly. In this case, the VCC and evaporator fan will run at the highest speed possible to rapidly bring temperatures into range. When cold storage is not used for extended periods, the VCC and evaporator fan will run at very low speeds to efficiently maintain temperatures. OptiCool™ technology uses natural hydrocarbon (HC) refrigerants in place of hydrofluorocarbon refrigerants (HFCs). Natural hydrocarbons are environmentally-friendly refrigerants that have very limited impact on Global Warming Potential (GWP) and no impact on Ozone Depletion Potential (ODP). This category of refrigerants is considered environmentally benign, and is also proven to be highly efficient by allowing significantly lower refrigerant charge when compared to HFCs. Natural hydrocarbon refrigerants differ from hydrofluorocarbon refrigerants as they are naturally occurring organic gases. HFCs are chemically manufactured gases that may remain in the atmosphere for up to 30 years after release. Hydrocarbon refrigerants have been developed as a safe, effective, and efficient alternative to HFCs. The US Environmental Protection Agency Significant New Alternatives Program (EPA SNAP program) was designed to identify and evaluate substitutes for substances that have negative effects on the environment. The EPA SNAP program lists hydrocarbon refrigerants as the replacement for HFCs. Similar regulatory and legislative pressures exist in many of the countries that ratified the Kigali amendment. This includes, but is not limited to, members of the European Union and Canada. OptiCool™ technology supports these global sustainability initiatives through the adoption of natural hydrocarbon refrigerants that are designed to address global warming and ozone depletion issues. OptiCool™ cooling technology applies VCC, ECM, and Natural Hydrocarbon refrigerants to medical-grade cold storage. These technologies are designed to improve both performance and reliability of the overall system, as well as to address evolving global environmental regulation. Evaluations of OptiCool™ technology have demonstrated temperature performance, energy efficiency, noise reduction, and high levels of reliability. Helmer Scientific is pleased to offer this technology in GX Solutions. With over 10 years of experience in Medical Device and Life Sciences marketing, Ben is the Director of Marketing at Helmer Scientific with a focus on inbound / outbound marketing, strategic marketing, and new product development.